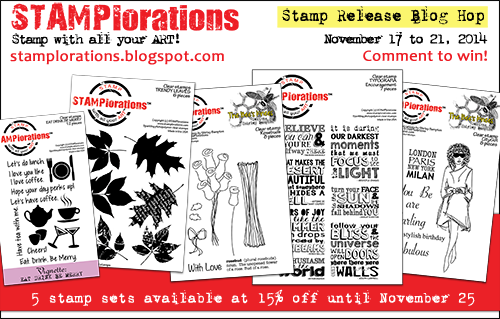 Welcome to Day 3 of the November Stamp Release Blog Hop here at STAMPlorations! For complete info on our hop, including how you can win stamps, click here. Today, we're putting the spotlight on TYPOGRAFIA. We'll be picking one commenter to win this set so leave a comment here and on the rest of the STAMPlorations girls' posts for a chance to win the set. I love all the mixed fonts on these quotes. I paired the quote with some leaf images (you'll see more of those on Friday), and I actually used some patterned paper from my paper mountain! So pretty! Love how the leaves have so much color in them. Great job! Love the colorful fall leaves in water color, a pretty creation with Typografia sentiment!! Oh my...your leaves are gorgeous! Some day I'll get this water-colouring technique figured out. Until then, I'll just gaze in admiration (and wistfulness) at your stunning creations! Awesome autumn card. Fab sentiment too. Gorgeous colors - love those leaves. Very nice job on this card! The water colored leaves was a brilliant idea! Love the colors on your leaves. Your leaves are stunning! Beautiful work! Oh these leaves are the perfect background for these words! Gorgeous Autumn colours and love that sentiment. Your watercoloring effects never cease to amaze me. Really, really pretty! Pretty card - love the leaves and the CAS look. Another stunning card! The falling leaves complement the sentiment so well! White background, watercoloured leaves make perfect sense to the sentiment. Fabulous card you make, again. Great card and sentiment. Love your CAS approach.